Sometimes Jake and I like to up to Orange County for a little day trip. This particular trip was inspired by Jake wanted to check out a new Funko! Pop shop and I managed to sneak a bit of food into the trip. It’s what I do. 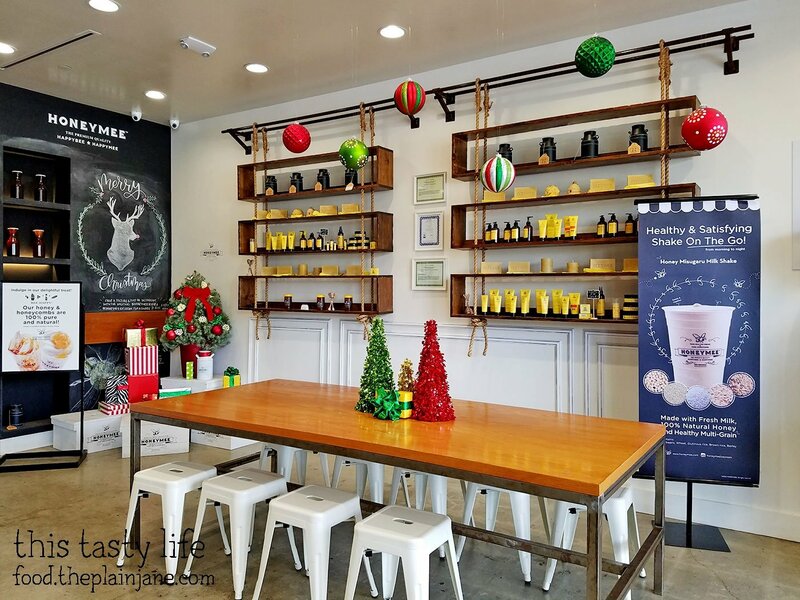 Our first foodie stop was at the Union Market at The District in Tustin. The District is basically a big old mall in Tustin. Union Market is kind of like our Farmer’s Public Market at Liberty Station. It’s a little shopping area filled with a mix of restaurants, cafes, and shops. Not every stall had something in it and it seemed like half of the places in here were closed. 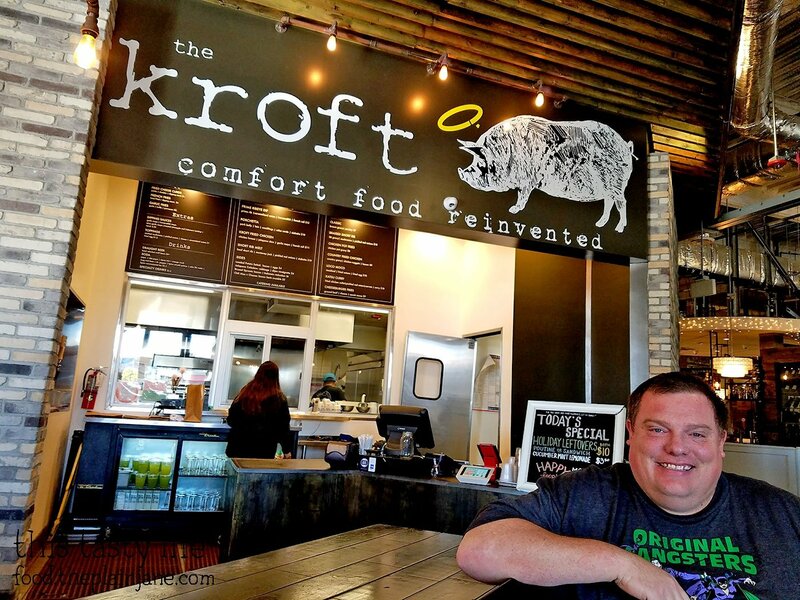 But that’s okay – we were here to visit The Kroft. 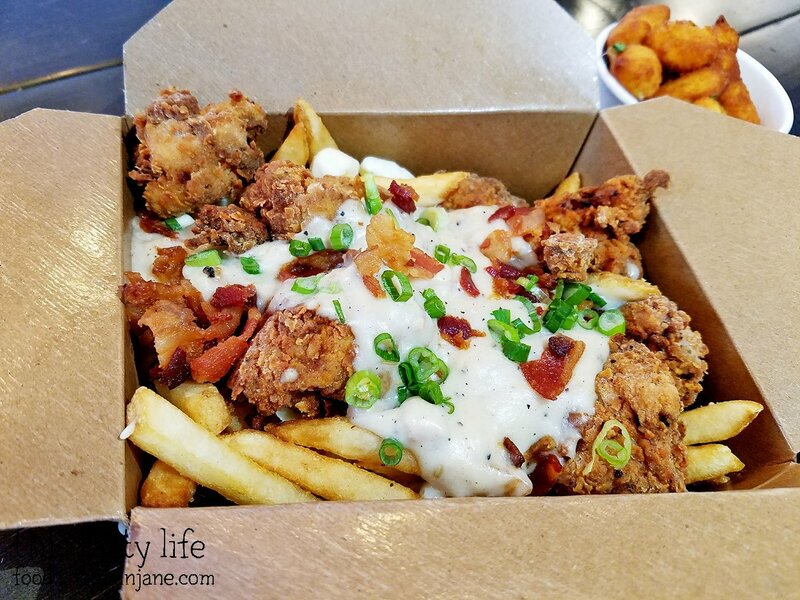 If you haven’t already guessed, the thing that caught my eye about the Kroft was their interesting take on poutines. Normally poutine is fries, cheese curds, and gravy. But at the Kroft they mix it up a bit to create their own unique flavor combinations involving poutine. They have another location in the Anaheim Packing District. They seem to have a thing about “districts” up in the OC, eh? Fried Cheese Curds [$5] were one of the very first things I spied on the menu. I ordered them. OF COURSE. They were 100% worth it! The cheese was nice and hot resulting in a nice stringy, gooey bit of cheese. The panko coating gave them a nice sturdy exterior. These were so good I wanted to hoard them all for myself but I was nice enough to share with Jake. 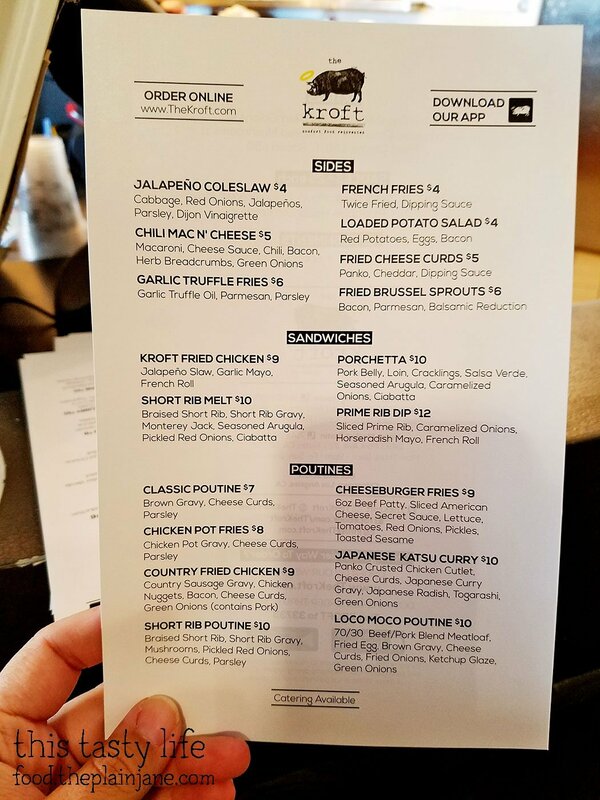 They had a few poutines on the menu at the Kroft that Jake and I wanted to try, but we decided to go with the Country Fried Chicken Poutine [$9]. I ended up mostly just liking the country gravy and melted gooey bits of cheese curds on top of the hot french fries more than the chicken bits. I usually like things that don’t have too much stuff on top whereas Jake seems to like more “stuff” on top since he loved the chicken bits. Mostly I’m glad that we shared this because it was a lot of food! I enjoyed the thick, white, country gravy but Jake thought it needed more seasoning. We both seemed to like different aspects of the poutine so it seemed to work out for us overall. I made the final decision on the sandwich we shared. 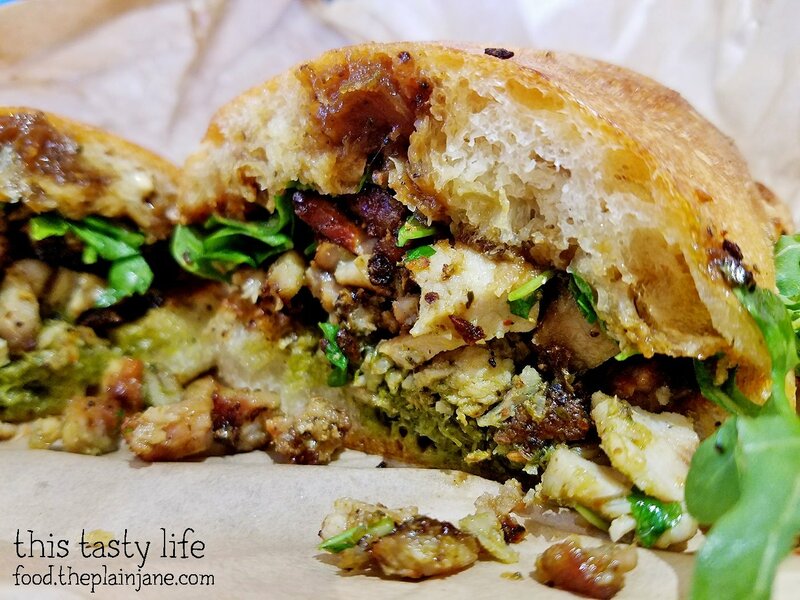 The Porchetta Sandwich [$10] was chock full of flavor – it’s got pork belly, pork loin, and cracklings all mixed in with salsa verde, arugula and caramelized onions on ciabatta bread. This had SO MUCH flavor – it was actually overwhelming for me to eat it. I didn’t really care for the salsa verde, either. 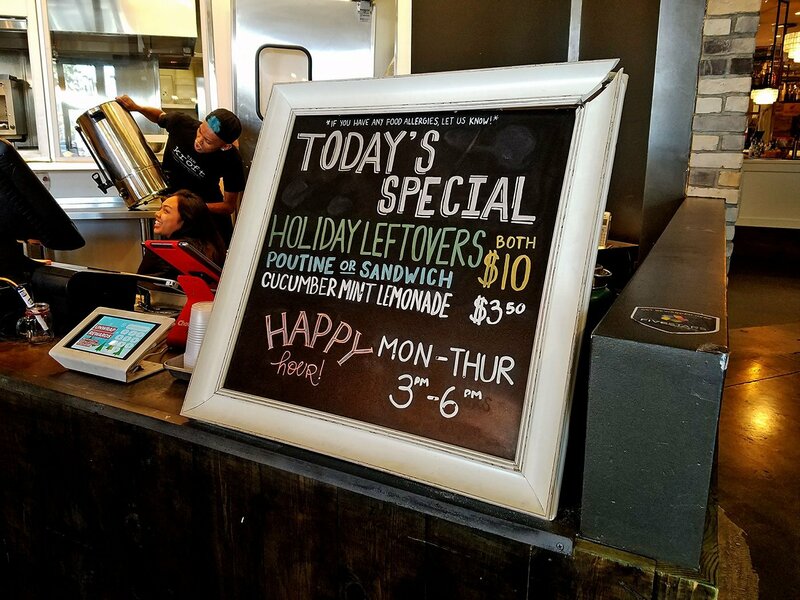 It made the sandwich a bit spicy and I felt like there were too many flavors going on. Jake was fine with it though and luckily he polished off the sandwich for us since I wimped out. After lunch it was time for a little dessert before we headed home. 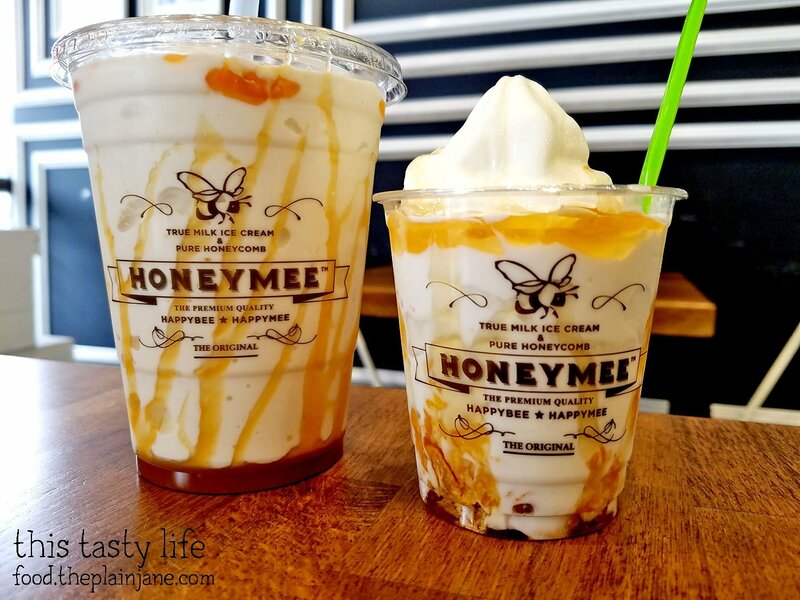 I’ve been following Honeymee on Instagram and drooling over their soft serve with swirls of honey. It was finally time I got to try it for myself! 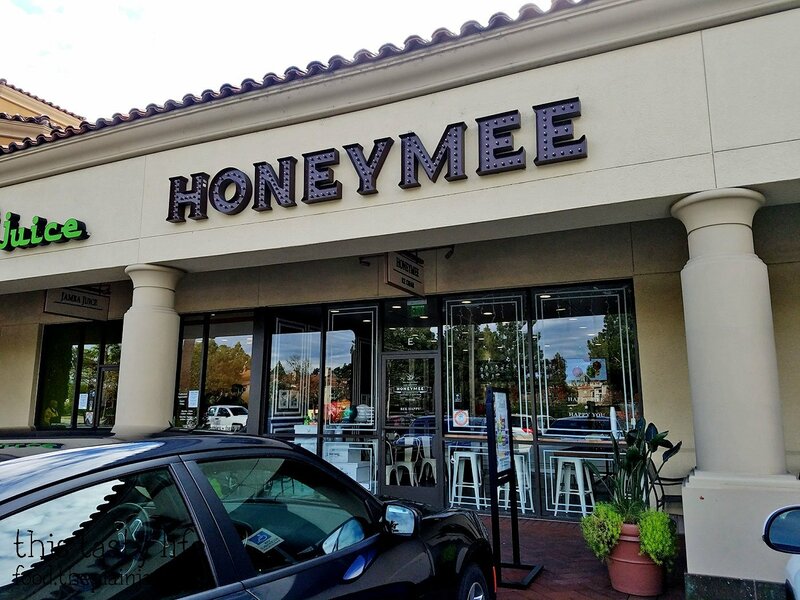 Honeymee has several locations in Los Angeles and Orange County. We visited the one in Irvine, right off the 405 (there’s another one also in Irvine that’s off the 5). They still had their holiday decor up! They have ice cream, shakes, tea, and waffles. I didn’t see the waffle menu, but I was only interested in the ice cream that day. 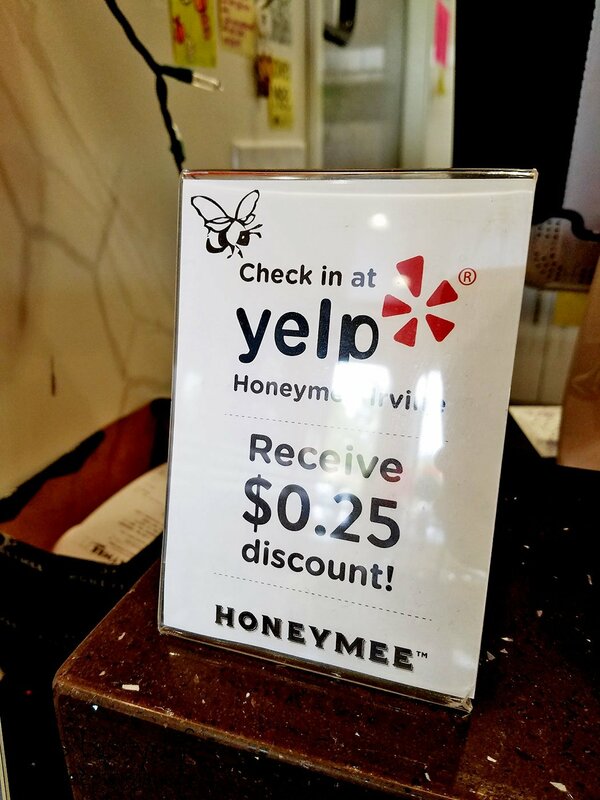 You get a discount if you check in with Yelp. It’s like getting a free topping. 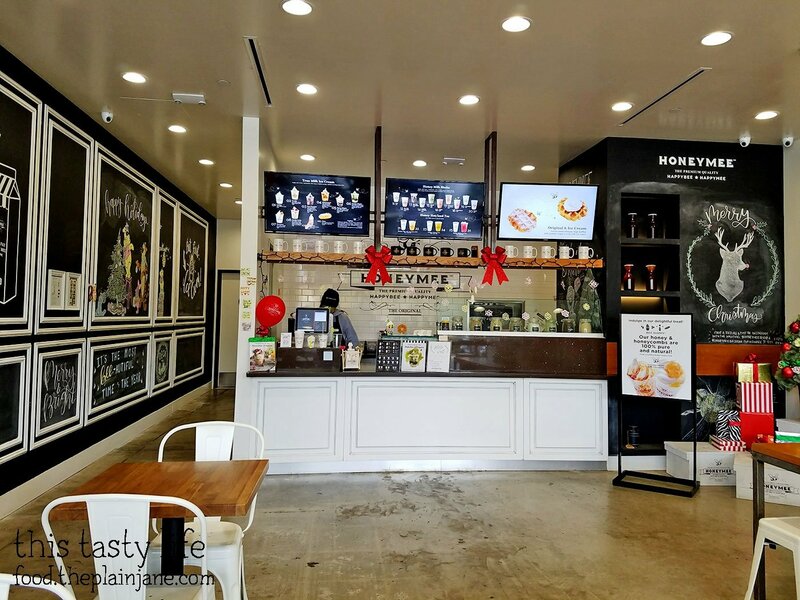 At Honeymee, their soft serve ice cream is made with milk from a certified Kosher dairy factory and they do not have any artificial colors or flavors to the ice cream. They call it “True Milk” ice cream. Jake opted to get the Sea Salt Caramel Honey Milkshake [$5]. While the caramel tasted good, I felt the shake was just a little too sweet. It was still delicious but I felt like the caramel took away from the flavor of the delicious ice cream. 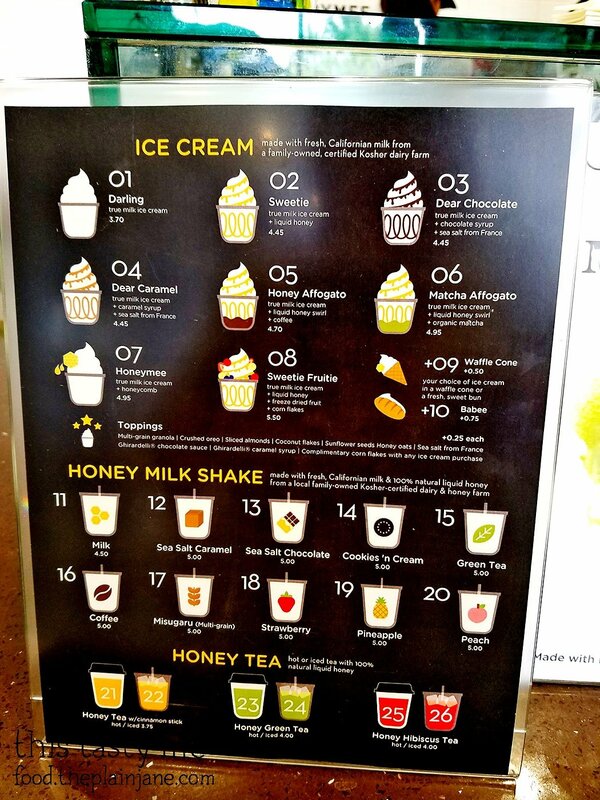 I wanted to try the ice cream and honey together so I ordered the Sweetie [$4.45]. I opted to add the complimentary cornflakes to my dessert. 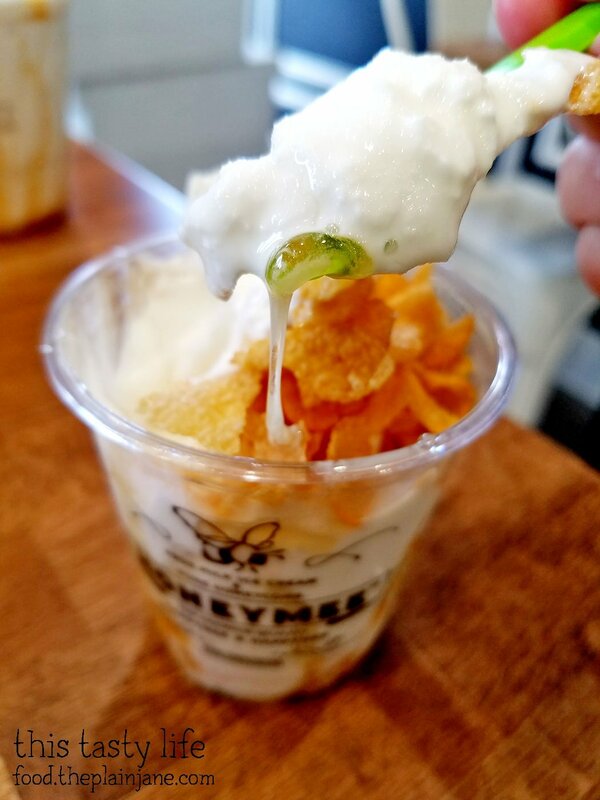 The cornflakes were put into the bottom of the cup, drizzled with honey, and had the True Milk ice cream on top. I asked Jake to go back up and add sea salt to my ice cream for 25 cents and he got me more cornflakes which I put on top. I liked the extra sprinkle of salt to offset some of the sweetness from the creamy milk ice cream and the rich, silky honey. The cornflakes provided a wonderful texture to contrast with the ice cream. I savored every bite of this scrumptious ice cream and was glad that this place isn’t closer to us. If it was I’d want to come here all the time! Great looking shakes! I usually prefer them plain as I don’t like them too sweet either. Hi Soo – Thanks! The flavor of the ice cream is really nice here. So creamy! 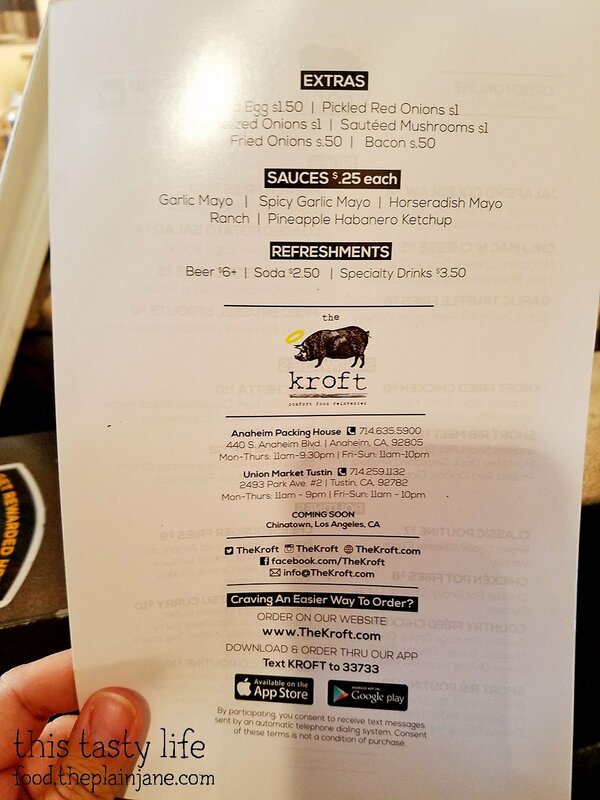 I don’t think I loved The Kroft too much when I tried it at the Anaheim Packing District. It was alright, I guess. Maybe I should try something else there because I wasn’t too crazy about what I had gotten at the time (I don’t remember what it was, I’d have to refer back to my IG to remember). I do want to try Honeymee though. Looks like total indulgence! I love one day road trips. I need to take one to SD one of these days. I don’t think I’ve been there in oh..how many years?! I’m on chat with Hostgator at the moment, patiently waiting and hoping that I don’t have to resort to crying later because of you know what! Thanks again for your help. 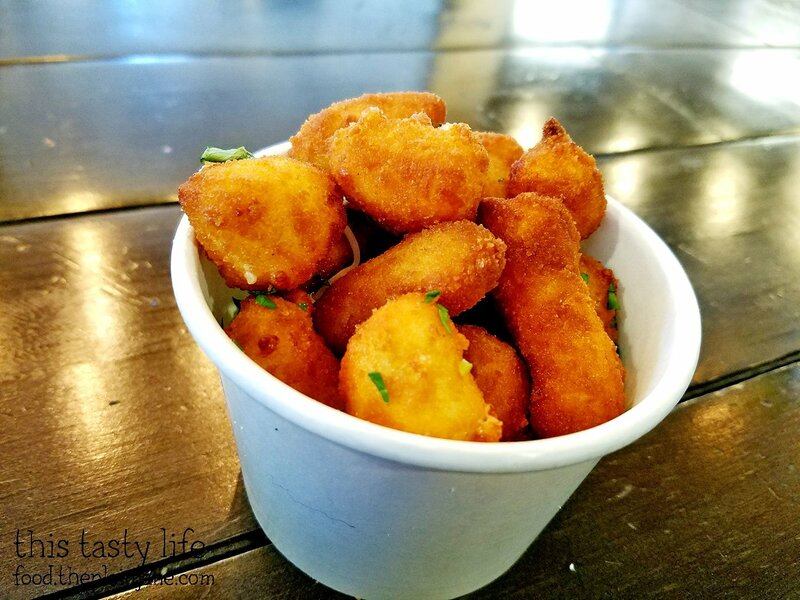 The cheese curds were my favorite thing about the Kroft! 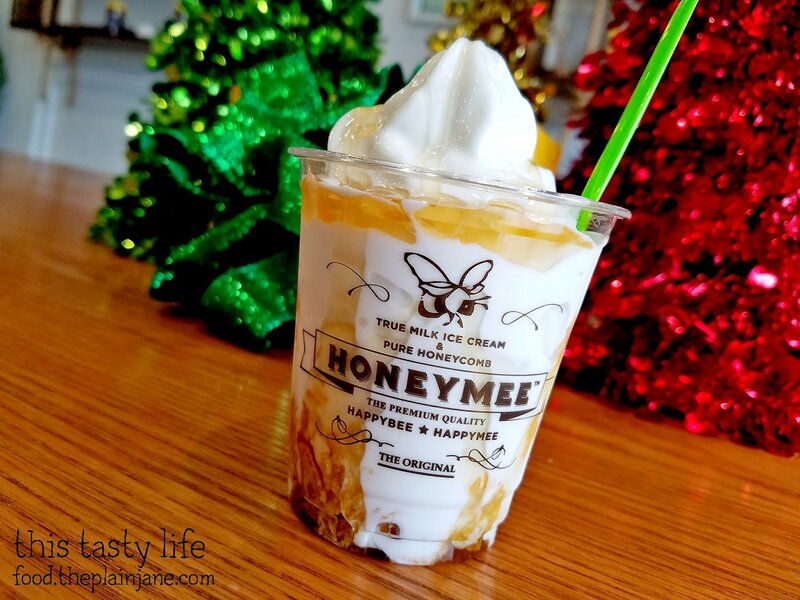 Honeymee you definitely have to try – it is delicious! One day road trips are fun and you guys have a good variety of stuff up in OC/LA that it makes for fun trips. You should make the trip down to SD sometime. If you need suggestions, let me know! Aww, I hope everything gets resolved soon! 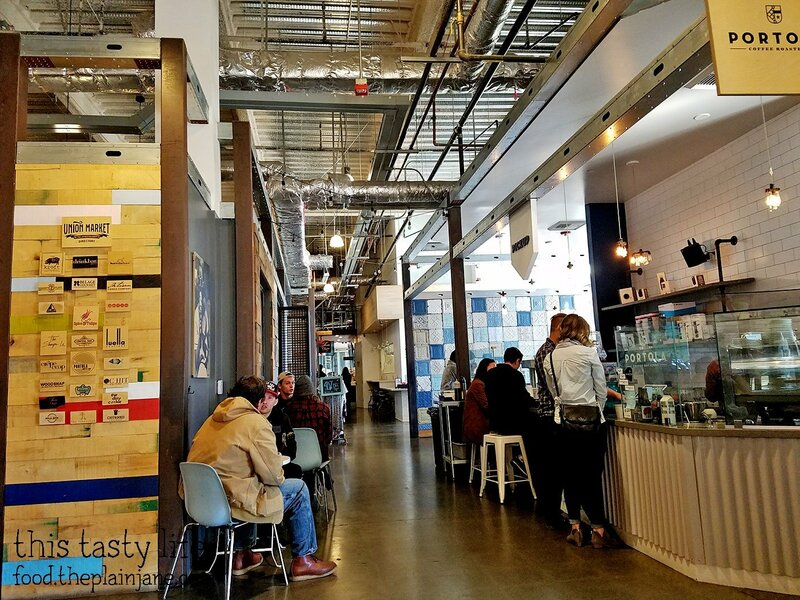 I saw in one of your photos the coffee place, Portola Coffee Lab which we visited almost 2 years ago. I think this place was just built and didn’t have all of the tenants yet. It may be time for a revisit! Did you notice the humongous zeppelin hangars on your way there? Those things are Gigantic!